Sir Shina Peters & His International Stars - Sewele. Vinyl LP. Bleep. Strut have outdone themselves with this latest reissue. 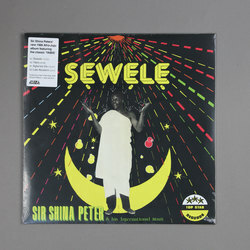 1986’s Sewele LP from Sir Shina Peters And His International Stars is one of those ultra-rare Nigerian classics that makes collectors go all misty-eyed. The tunes here combine the talking-drum workouts of King Sunny Ade, hi-life guitar licks and, on a cut like ‘Yabis’, the propulsive grooves of Lagos Funk. Peters himself dubbed the sound AfroJuju, and this remastered edition of Sewele stands as one of the finest examples of the style.